We had a great time at Bruin's Den on our first trip to the Smokies - we highly recommend Bruin's Den. Bryson City was a nice small town with plenty of conveniences and the location was close to the hiking and white water rafting trips we had planned. The house was very clean, had all amenities we were looking for, and was a great place to relax and enjoy the Smoky Mountain scenery. We had a great time, thank you for sharing your cabin with us. It's convenient and relaxing. We enjoyed the train ride, NOC, the Biltmore and hiking Clingman's Dome. We spent the rainy day relaxing before leaving. This is out first time here. The cabin was so clean and the view was great. Can't wait to come back. Entire family enjoyed their stay. Was central to good hiking, tourist sites, and fishing. Cabin was clean and well kept. Exceeded all expectations. Bruins Den has the perfect home away from Home. We loved our time here and hope to be back again. Felt like we right at home. Thank you and we will be back. 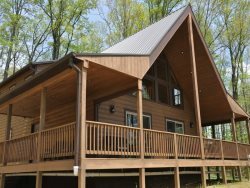 We loved everything about the cabin, so Comfortable and homey. Wonderful Place to stay when visiting the Smokies and surrounding area. Absolutely loved Bryson City and the trip on the railroad. Good communication and ease of booking and checking-in. We had a great time visiting Bryson city and using the cabin. The grand kids really enjoyed the fire pit and Santa Express. We will certainly like to visit again during Spring/Fall time. Thanks for keeping such a well kept cabin. Whenever I called with a question, whomever answered the call was very knowledgeable and courteous. Thank you. What a wonderful home. so welcoming and clean and such incredible views. We had an incredible week exploring the town. The cabin was beautiful and can't wait to come back. Thank you for giving us the pleasure of staying in your lovely cabin. It is more than we ever expected. We will be back again. Great View. The process was so efficient and easy I really had no need to work with anyone! Very helpful to a first time mountain visitor and cabin renter. Beautiful Home! Spectacular View! Enjoyed the weekend in Bryson City and the Polar Express. Beautiful cabin and breathtaking view. We all had a wonderful time. Thank you for sharing your lovely place. This house was so charming and we all really loved it !! The views are simply breathtaking and everybody took advantage of the beautiful porch. This was an awesome place for a vacation and we would definitely like to come back again! !